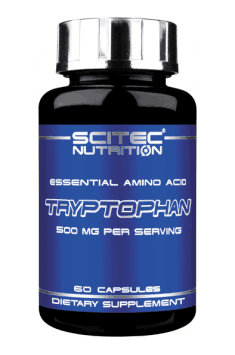 The requirement of tryptophan decreases with age. As a result, the dosage for children is as much as 13 mg per kg of body weight, whereas 5-6 mg per of kg of body weight is sufficient for adults. What is more, the minimum dose for older individuals is 3 mg per kg of body weight. For this reason, it is indicated to follow the manufacturer’s recommendations and not exceed the recommended daily dosage (1 capsule). Due to the supplement’s mechanism of action, it is recommended to take it at bedtime. The supplement should be taken under medical supervision in children, pregnant and breast-feeding women and patients with liver failure or taking antidepressant drugs. The supplement is contraindicated in individuals with brachycardia, hypoglycaemia and scleroderma and during steroid therapy and oral contraception.